93Pts. - Wonderful aromas and an intense and layered palate with a lovely fresh acidity. 2017 The Agnes Chardonnay has a neutral nose at first, offering faint traces of yellow plum and lemon curd; the citrus element develops with aeration. The palate is very well balanced with citrus lemon, blood orange and light marmalade notes that lend spiciness toward the finish. Very fine. The Agnes is produced using the traditional method of transferring the whole grape clusters straight from harvesting into the press and running the juice off into a settling tank. The juice is then transferred the next day into 228-litre French oak barrels, 10% new. Fermentation occurs naturally in barrel, where it remains for 9 months before bottling. No SO2 or enzymes are added prior to fermentation. 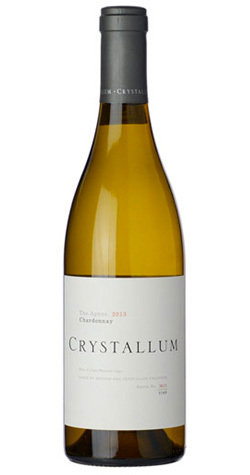 Crystallum wines is a small, family run and privately owned winery based in the Walker Bay region of South Africa. The brothers are the third generation of Finlayson winemakers and the sons of the man who pioneered Pinot Noir making in the Hemel-en-Aarde valley. Andrew is an Architect by training and Peter-Allan studied philosophy and economics at the University of Stellenbosch. It did not, however, take long for the lure of wine to pull them back into the cellar. The company was started in 2007 with 4134 bottles of Sauvignon Blanc produced. The 2008 vintage saw the introduction of Pinot Noir and Chardonnay. Crystallum is now exclusively producing these Burgundian varieties.